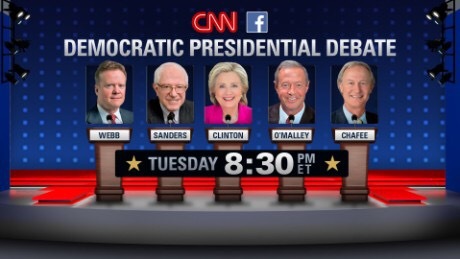 Well, I don’t know what else is on TV tonight, but I am ready and waiting for the first Democratic Presidential Debate to air on CNN. CNN will be providing live updates during the telecast which will be moderated by CNN’s Anderson Cooper. Apparently, Presidential hopeful, Vice President Joe Biden, will not be part of the debate but you can bet he will be watching from the comfort of his home. The outcome of this sparkling debate will no doubt influence his decision on whether or not he will enter the Presidential race. Well, my money is on Team Hillary. No one has worked harder and she comes equipped with incredible experience and wisdom. This is her time. Who are you rooting for? You are going to watch, aren’t you? It’s in Las Vegas so, who knows, Cirque De Soleil may make an appearance. It’s 8:30 PM. It’s showtime! so, what did you think? i didn’t get to watch, but i did read twitter. lots of positive words. i was proud. It was an exceptional debate. Hillary and Bernie were in fine form. The other three candidates did well but were more intimidated by the scope of this debate. However, it was first class all the way. Strong candidates.